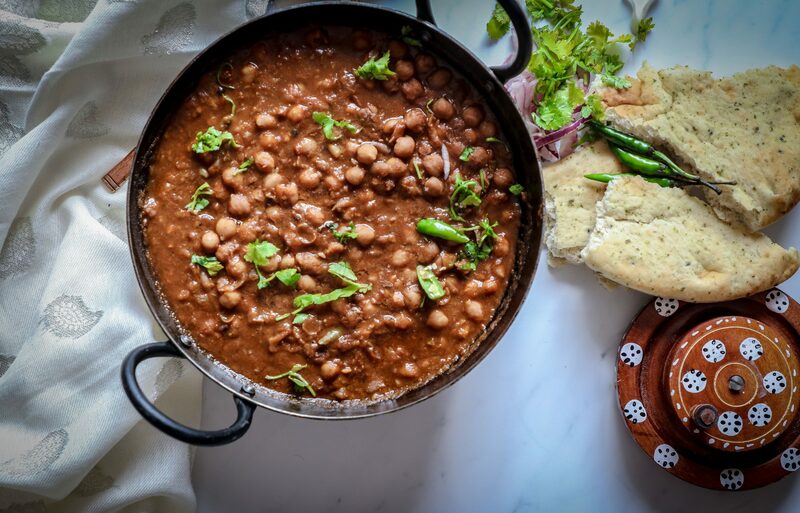 Punjabi chhole (chickpea curry ) , or chana recipe, is the very humble chickpea curry , famously trending the international food chart these days. 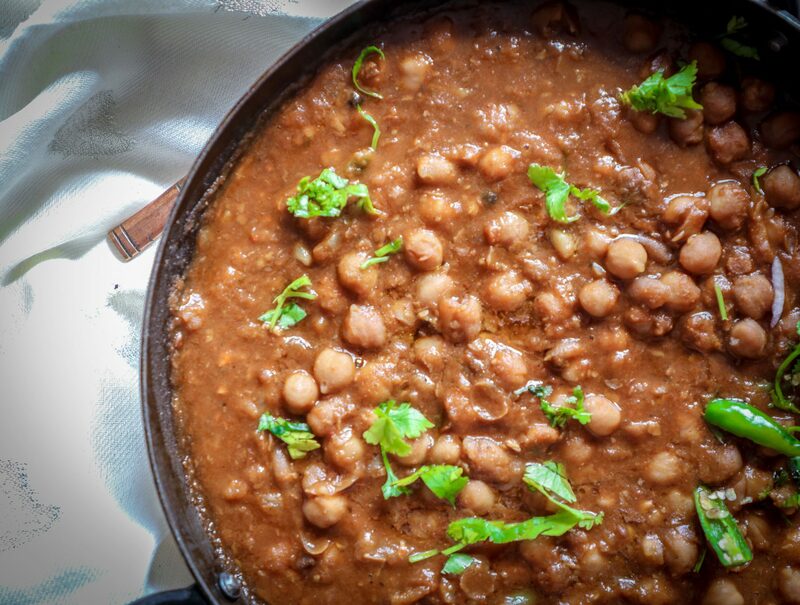 There’s a number of ways the white chickpeas are cooked in India. Most famous being the Punjabi cooking method. The recipe that I’m writing below, is the way that it is cooked at my home, by my mum, and is also followed in many Punjabi households. There’s a whole lot of ground and whole spices used in this recipe. The secret ingredient of this authentic recipe being the black tea. 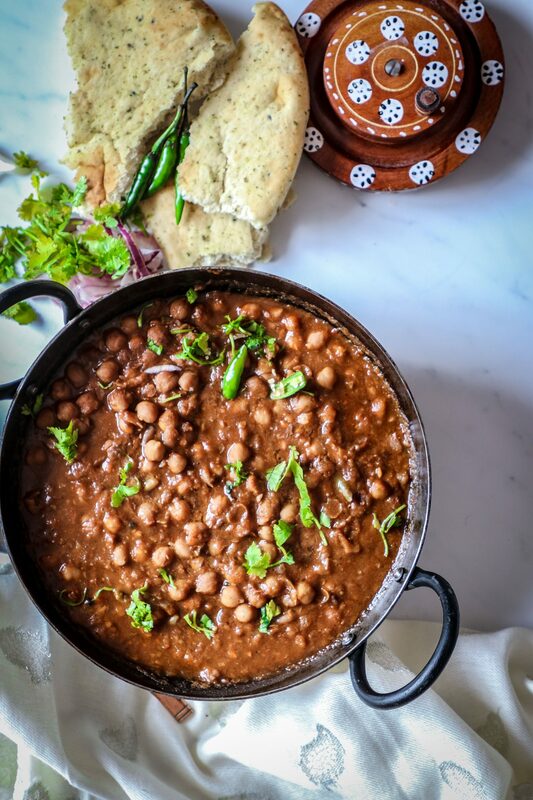 Yes, a tea bag, or brewed tea is added to the recipe to add a smoky taste ,aroma and most importantly colour to this Punjabi chickpeas curry. The other alternative to using the tea , is using roasted ground cumin powder, which again gives a nice flavour and dark colour to these chickpeas. 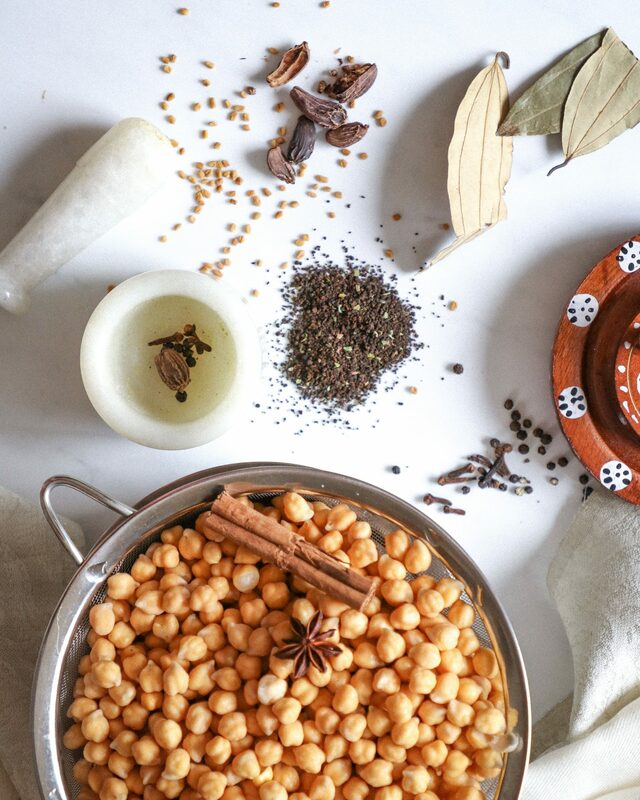 And there is another method of cooking the chickpeas quick, which uses very few ingredients. That i’ll leave for another post. 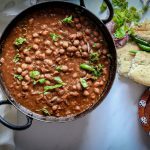 For this authentic Punjabi chhole recipe, the ingredients you would need while boiling the chickpeas, are fenugreek seeds (methre), black cardamom, bay leaf, cloves, whole black pepper, cinnamon stick, star anise, a pinch of baking soda (optional) and a tea bag or a cup of brewed black tea. For tempering you would need ghee (or oil),onions, asafoetida powder (hing),cumin seeds (jeera),tomatoes (optional), garlic, ginger, green chillies,Black pepper powder, red chilli (Deghi mirchi) powder,Roasted cumin coriander powder, Kasoori methi powder, amchoor (dry mango powder),Chana masala powder. 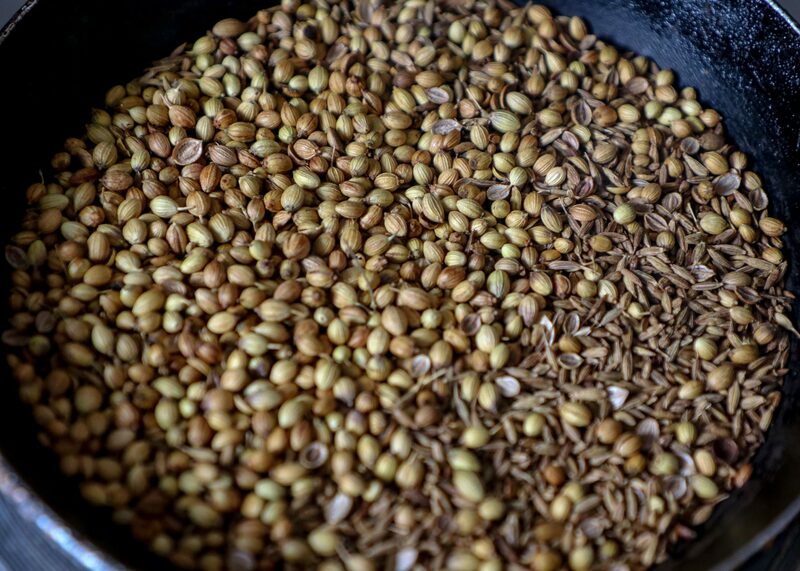 Add 1 tsp of coriander seeds, 1 tsp cumin seeds to a hot pan. Keep stirring, so that these do not burn. Heat for 3-4 minutes, till you can smell the strong flavours. Take off heat, and let cook. Once cool, powder these in a grinder to a fine powder. You can use these for adding flavour to curries , raitas, and biryani. As always with any whole legumes I always suggest soaking them overnight, before cooking, we follow the same procedure here. Soak the white chickpeas overnight in enough water. When cooking, rinse these thoroughly with clean water, and in a pressure cooker, boil these along with methre(fenugreek seeds),black cardamom, bay leaf, cloves, whole black pepper, cinnamon stick, star anise, little baking soda (optional) and a tea bag or brewed black tea. Boil the chickpeas for about 15-18 minutes on slow heat. 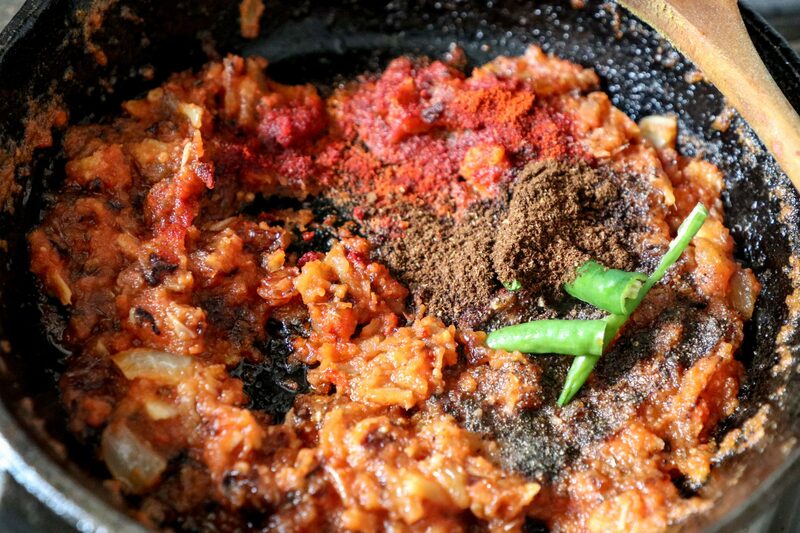 Once done, open the cooker, and you can discard the whole spices and tea bag, as the flavour has been induced in your curry. If you are not using a tea bag, you can use brewed tea. To make it just boil 1 tsp of black tea in a cup of water. Once boiled, sieve it, let cool and keep aside. This recipe can be cooked without tomatoes. If you do not have tomatoes, or do not want to use tomatoes , for any reason, you can use amchoor (dried mango powder), or anardana (Dried pomegranate seeds powder). Both amchoor and pomegranate seeds powder are easily available in India.Out of India these are available in asian stores , or even on amazon. In a pan heat ghee / or oil. Add asafoetida powder, Cumin seeds, and let it splutter for a few seconds. Add Chopped onions. 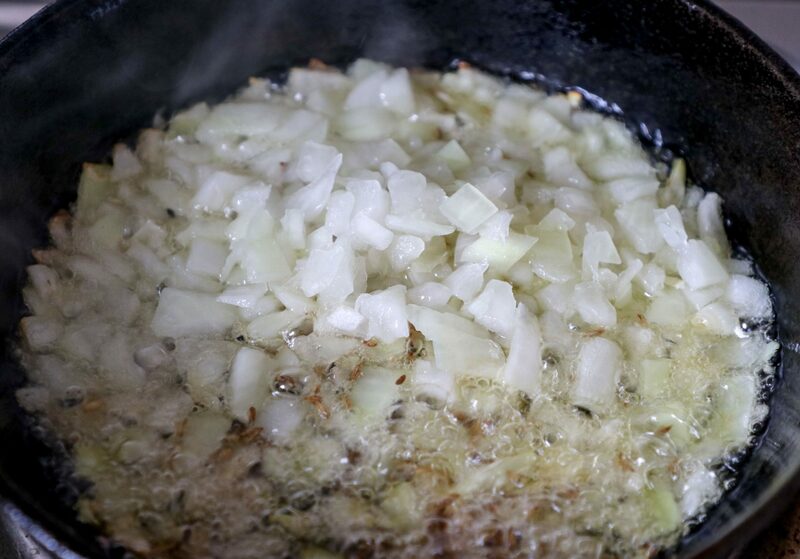 Fry till onions are light golden. Add crushed ginger garlic/ ginger garlic paste. Sautee till the raw aroma goes away. Now add the pureed tomatoes, and cook till the oil leaves the sides. 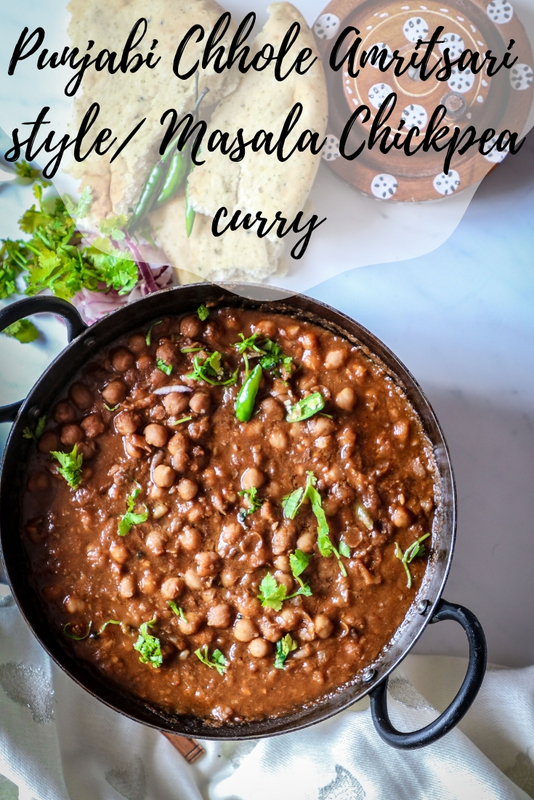 Add slit green chillies, black pepper powder, red chilli (deghi mirchi)powder, roasted coriander and cumin powder, Kasoori methi powder, chana masala powder. Mix well. Add the tempering to cooked chickpeas. Mix well , cover and let it simmer for another 10 minutes. When done, add amchoor powder. Garnish it with a drizzle of ghee, fresh coriander leaves and slit chillies. Serve these hot with bhathuras, Pooris, naan bread, rice or Kulchas, accompanied with salad, pickle, chutney and Raita. In a pressure cooker, boil water. Add chickpeas . Add whole spices- fenugreek seeds, black cardamon, bay leaf, cloves, cinnamon stick, star anise (half),whole black pepper ,a pinch of baking soda. Throw in a tea bag.Mix well, and pressure cook everything for about 15-18 minutes.Keep aside. Heat 2tbsp ghee. Add a pinch of asafoetida powder, cumin seeds and let it splutter for a few seconds. Add Chopped onions. Fry till onions are light golden. Add crushed ginger garlic/ ginger garlic paste. Sauté till the raw aroma goes away. Now add the pureed tomatoes, and cook till the oil leaves the sides. 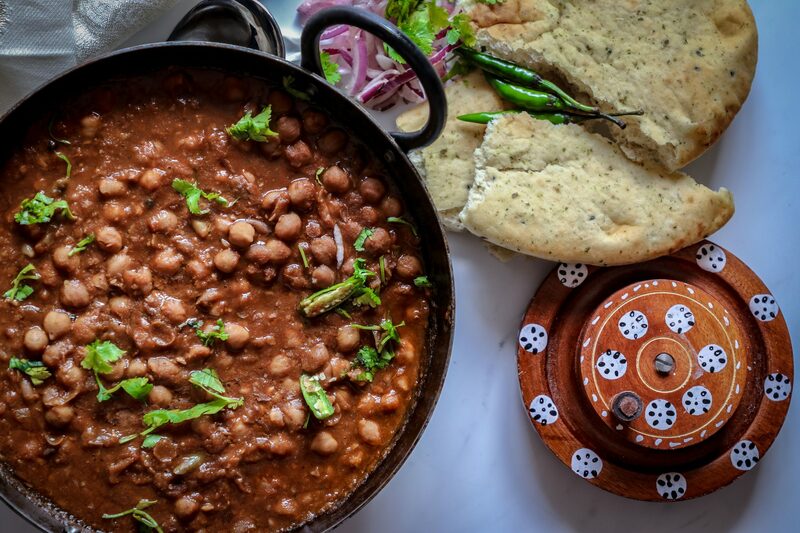 Once tomatoes are cooked, add slit green chillies, black pepper powder, red chilli (deghi mirchi)powder, roasted coriander and cumin powder, Kasoori methi powder, chana masala powder. Mix well. Add the tempering to cooked chickpeas. Mix well , cover and let it simmer for another 10 minutes. . When done, add amchoor powder (Mango powder). Garnish it with a drizzle of ghee, fresh coriander leaves and slit chillies . Serve these hot with Pooris, naan bread, rice or Kulchas, accompanied with salad, pickle, chutney and Raita. Either add a tea bag while boiling. 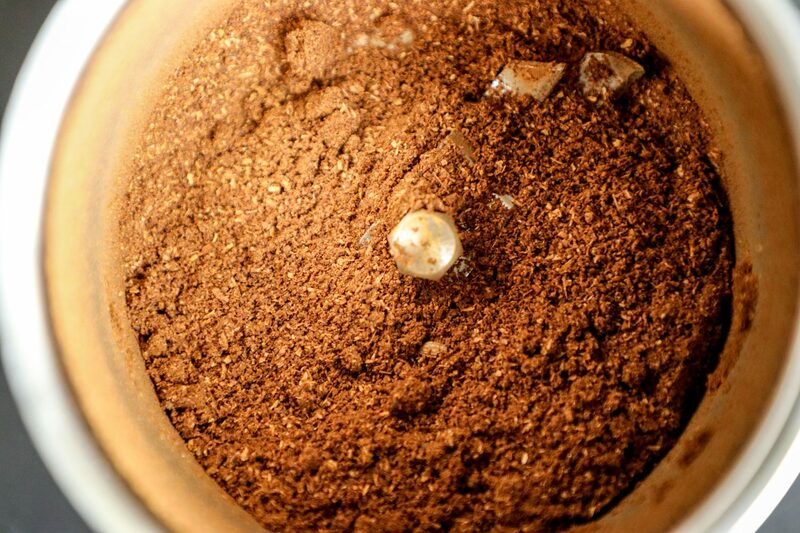 Or if adding brewed tea – Add 1 tsp black tea to 1 cup water. Bring it to a boil. 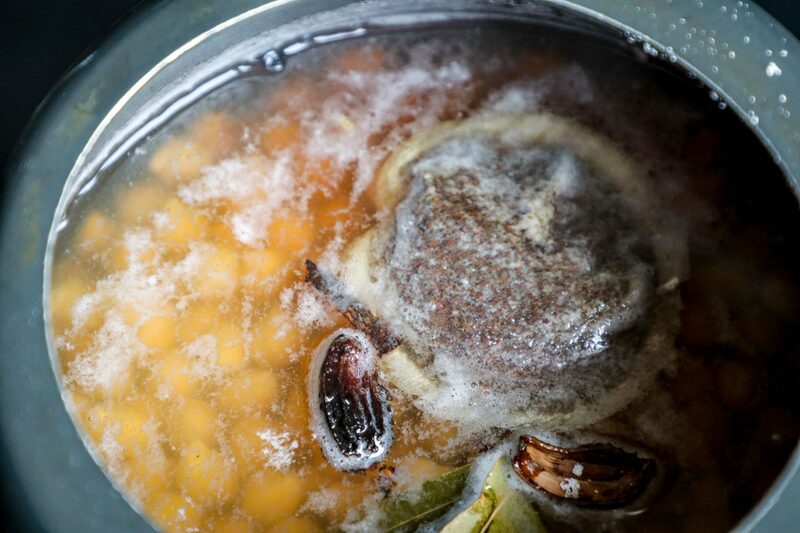 Sieve it and add it water to the boiled chickpeas, before adding tadka/ tempering. Take a tbsp of boiled chickpeas (before adding tempering), and mash them with back of the spoon/ or fork, and add back to the chickpeas.Mix well. Follow rest of the steps.